A “LEAST RISK,” FACTOR-BASED APPROACH. Many advisors believe that your portfolio should be as risky as you can tolerate. They’ll hand you a risk-tolerance assessment, score it, and then set-up your portfolio so that you experience the maximum level of risk (volatility) that you can (theoretically) tolerate. They then offer, as part of their “value proposition,” to help you stay the course during times of severe volatility. While this approach may result in higher portfolio values over the very long-term (because risk and return are closely related), it can actually diminish your odds of meeting your most important financial goals. It also is an unnecessarily painful approach: It’s analogous to going to the dentist for a root canal, being tested for your highest level of “pain tolerance” and, then, being given just enough pain medication so that you experience as much pain as you can tolerate. Least risk investing is about attaining your goals with as little risk as practical and then, once you’ve arrived at your financial destination, decreasing your risk even further, if possible, to protect what you have. Especially for affluent investors, least risk investing is not about maximizing the chances of getting richer, it’s about minimizing the chances of becoming poorer. It is a sad paradox that those who can afford to take the most risk (the affluent) and who are often advised to do so, are also the ones who most often should take the least risk. Employing high-cost funds and/or advisors. While we don’t use Dimensional Funds exclusively, we do believe wholeheartedly in their approach to investment management. Why? 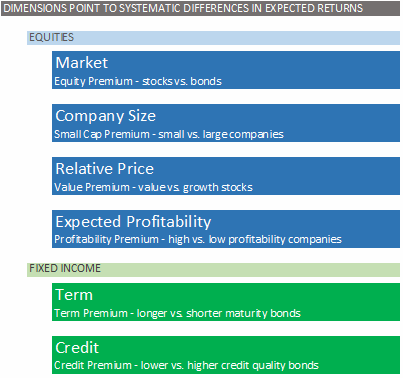 Because no other company has done a better job of discovering and capturing the various dimensions of return (“factors”) that the stock and bond markets have to offer. In other words: stocks have higher expected returns than bonds, value stocks have higher expected returns than growth stocks, small cap stocks have higher expected returns than large cap stocks, and the stocks of companies with high relative profitability have higher expected returns than the stocks of companies with low relative profitability. Consider, for example, the S&P 500 – a widely cited index of the largest U.S. companies (by capitalization). From 1927 through 2012, the S&P 500 index returned 9.8% annually, on average. During that same time period, however, the large-cap value index returned 11.6% and the large-cap growth index returned just 9.2%. 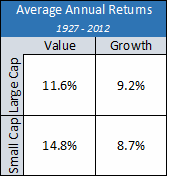 Similarly, during the same time period, small cap stocks returned 11.5% annually, on average; small value stocks, however, returned 14.8% while small growth stocks returned just 8.7%. With this knowledge at hand, DFA set out to develop a group of low-cost funds designed to capture these various dimensions of return. And their historical track-record speaks for itself – few, if any, fund managers can claim two- to three-decades of consistently delivering what they promise to deliver. 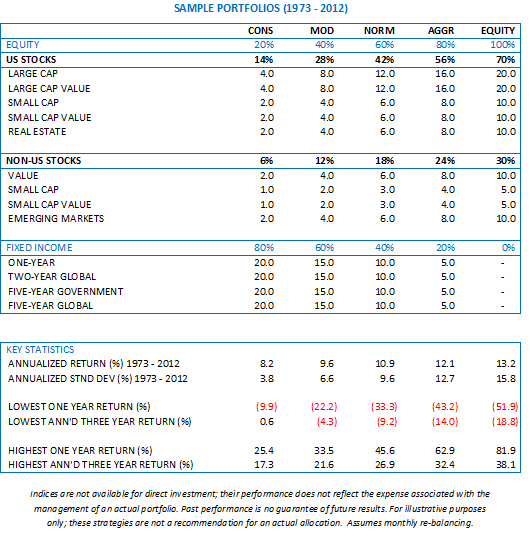 Importantly, note that even a well-balanced portfolio comprised of 60% stocks and 40% bonds, earned greater returns than the S&P 500 alone and did so with almost 1/2 the risk! Is that likely to occur again in the future? Probably not, unfortunately, given the once-in-a-lifetime bull market in bonds that we experienced over the past couple of decades. But even the all-equity portfolio provided a substantial increase in returns (versus the S&P 500), with considerably less risk. 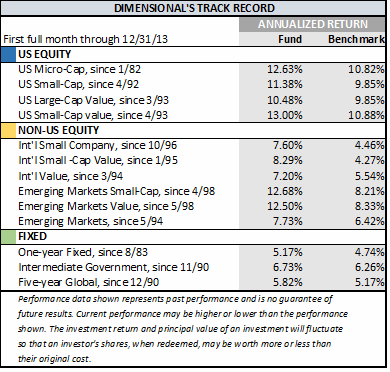 Click here for more information about Dimensional Funds.